Enjoy the comfort of a 3-star hotel with restaurant with all the necessary amenities for work and leisure. 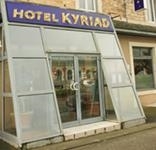 The staff at Kyriad Rodez welcome you all year-round in French and English. The reception is closed from noon to 4pm from Monday to Friday. If you plan to arrive between 12am and 4pm or after 10pm, please inform the hotel in advance.